The beautiful aspen is the quintessential Colorado tree. We've named towns, streets, dogs and our beer after this glorious tree. In the summer, the aspens provide shade for our state flower, the columbine; and when fall foliage comes on the scene, Coloradans rejoice as the aspens' gently tinkling leaves turn a vibrant shade of gold. Maroon Bells: Quite possibly the most photographed mountains in North America, the Maroon Bells are situated southwest of the aptly named town of Aspen. These peaks are an ideal spot to capture the glory of fall color on film. On weekends in September, access to the bells is limited to shuttle buses that leave Aspen on a regular basis. But if you reserve a campsite along Maroon Creek Road, you can drive your vehicle all the way to the scenic Maroon Lake, where the golden trees frame a reflection of the purple-and-white-striped peaks. Grand Junction to Grand Mesa: This route boasts spectacular stands of aspen along with other varieties of turning trees. 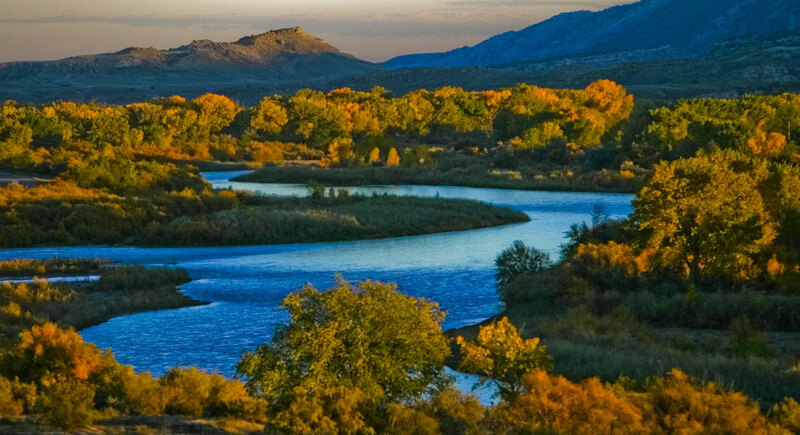 From Grand Junction, head east on I-70 through Palisade and along the Colorado River, where riverside cottonwoods slowly phase into yellow. At Colorado 65, head east and then south through more canyon country and up to the top of Grand Mesa, where glowing aspens stretch for as far as the eye can see. Dallas Divide and Lizard Head Pass: Begin your journey in the town of Ridgway. Head west on Colorado 62 over Dallas Divide. Lining the route are unimpeded views of the Sneffels Range, an apron of aspen trees at its feet. At Placerville, head southeast toward Telluride on Colorado 145. All the way to Lizard Head Pass you’ll drive through dense groves of white-barked aspens with panoramas of Wilson Peak. Kebler Pass: Head west out of Crested Butte over this improved dirt road (County Road 12) and you’ll be inundated with autumn glory. The ruddy colors of the Ruby Range make for a radiant contrast with the golden aspens below. At Colorado 133, you can head north toward McClure Pass for more, or return via the way you came for a repeat performance. Colorado 550 from Ridgway south through Ouray and Silverton to Durango. Cottonwood Pass: As you head down Cottonwood Pass Road west of Buena Vista, the massive Collegiate Peaks rise on all sides. As you pass beneath the mounts Princeton and Yale, you’ll enter one of Colorado's most aspen-laden valleys. And you'll see firsthand the fickleness of fall color — one slope all gold, another patch still a shade of summer green. Colorado 17 from Antonito to the New Mexico border: As you head up the serene Conejos River Valley, stands of pinyon give way to the white trunks of aspen. Some of the oldest and tallest aspens in the state can be seen, photographed and enjoyed near La Manga Pass. For an even more unique experience, ride the Cumbres & Toltec Scenic Railroad for views not seen on any highway. Peak-to-Peak Scenic and Historic Byway: From Black Hawk to Estes Park, this highway meanders through valleys and skims the top of ridges. Take Colorado 119 from Black Hawk north to Nederland then follow Colorado 72 to Raymond. From here, proceed on Colorado 7 past the 14,255-foot Longs Peak to Estes Park. Quaking aspens pop up in surprising places along the entire route. Guanella Pass Scenic and Historic Byway: Take this rambling route south out of the historic town of Georgetown and you’ll find pockets of blazing aspen. Once you reach the town of Grant, you turn right on US 285 and take the highway for 15 minutes to the top of Kenosha Pass, where the aspen thrive on the rim of the gentle slopes that encircle South Park. Frontier Pathways Scenic and Historic Byway: Head west out of Pueblo on Colorado 96 to begin this aspen-laden drive. The route climbs into the Wet Mountains and descends into the Wet Mountain Valley, passing aspens blazing in autumn color along the way. Return the way you came until you reach McKenzie Junction. From here, head south on Colorado 165 to see two other Colorado fall favorites, cottonwood and scrub oak, as they turn brilliant colors beneath rugged rock formations. Highway of Legends Scenic and Historic Byway: This route wraps around two of Colorado's burliest mountains, West and East Spanish Peak. Along the way, the highway passes beneath ancient volcanic walls that rise over tracts of pine, scrub oak and aspen. Nearly the entire route from La Veta to Trinidad on Colorado 12 begs to be photographed.